Way back then the term Terabyte might have been coined already as a very theoretical term, but in the mid-80s most of us did not even have hard drives – we were happy enough if we had dual floppy drives to run our programs AND store our data. We never thought that we could ever fill a gigabyte of storage, but were happier with hard drives than with floppies because they were less fragile (especially with so many magnets about). Now of course we are in a much more enlightened age, where most of us need hundreds of gigabytes, if not more. 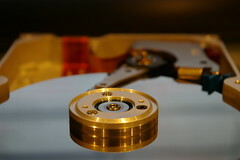 With storage requirements growing exponentially, the 2TB drives that we used to think were beyond the needs of all but the largest companies are now available for consumers, and corporations are needing to put several of those massive drives into SAN arrays to support the ever-growing database servers. As our enterprise requirements grow, so must the technologies that we rely on. That is why we were so proud to announce the new VHDX file format, Microsoft’s next generation virtual hard drive files that has by far the largest capacity of any virtualization technology on the market – a whopping 64 Terabytes. Since Microsoft made this announcement a few months ago several IT Pros have asked me ‘Why on earth would I ever need a single drive to be that big?’ A fair question, that reminds me of the old quote from Bill Gates who said that none of us would ever need more than 640KB of RAM in our computers. The truth is big data is becoming the rule and not the exception. Now let’s be clear… it may be a long time before you need 64TB on a single volume. However rather than questioning the limit, let’s look at the previous limit – 2TB. Most of us likely won’t need 64TB any time soon; however over the last couple of years I have come across several companies who did not think they could virtualize their database servers because of 2.2TB databases. Earlier this week I got an e-mail from a customer asking for help with a virtual to physical migration. Knowing who he reached out to, this was an obvious cry for help. As a Technical Evangelist my job is to win hearts and minds, as well as educate people about new technologies (as well as new ways to use the existing technologies that they have already invested in). So when I read this request I had several alternate solutions for them that would allow them to maintain their virtual machine while they burst through that 2TB ‘limit’. The new VHDX file format shatters the limit, as we said. In an upcoming article I will explain how to convert your existing VHD files to VHDX. The one caveat: if you are using Boot from VHD from a Windows 7 (or Server 2008 R2) base then the VHDX files are not supported. Storage Pools in Windows Server 2012 allow you to pool disks (physical or virtual) to create large drives. They are easy to create and to add storage to on the fly. I expect these will be among the most popular new features in Windows Server 2012. Software iSCSI Target is now a feature of Windows Server 2012, which means that not only can you create larger disks on the VM, you can also create large Storage Area Networks (SANs) on the host, adding VHDs as needed and giving access as BitLocker-encrypted Cluster Shared Volumes (CSVs), another new functionality of the new platform. New in Windows Server 2012, you can now create a virtual connection to a real Fibre Channel SAN LUN. As large a volume as you can create on the SAN is your limit – in other words if you have the budget your limit would be petabytes! With all of these options available to us, the sky truly is the limit for our virtualization environments… Whether you opt for a VHDX file, Storage Pool, Software- or Hardware-SAN, Hyper-V on Windows Server 2012 has you covered. And if none of these are quite right for you, then migrating your servers into an Azure VM in the cloud offers yet more options for the dynamic environment, without the capital expenses required for on-premises solutions. Knowing all of this, there really is no longer any reason to do a V2P migration, although of course there are tools that can do that. There is also no longer a good reason to invest in third-party virtualization platforms that limit your virtual hard disks to 2TB. Adaptable storage the way you want it… just one more reason to pick Windows Server 2012! ← From Server Core to GUI to… MinShell?